This November, Sony BMG will make available a 30th Anniversary commemorative collection of the classic Star Wars soundtracks in a collectors' edition foil-printed boxed set. Inside are eight CDs, filled with John Williams' unforgettable Star Wars score. Each film of the original trilogy (Episodes IV, V and VI) has their score spread on two discs, accounting for six discs in total. 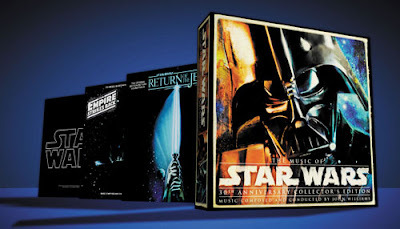 The remaining two discs include a special Star Wars: The Corellian Edition compilation of the most popular themes from all six episodes on one disc, as well as a CD-ROM of digital art of the original LP packaging, posters and insert. The set also comes with an all-new exclusive poster and collectable stickers. Keep checking starwars.com for more information on this set as November approaches.